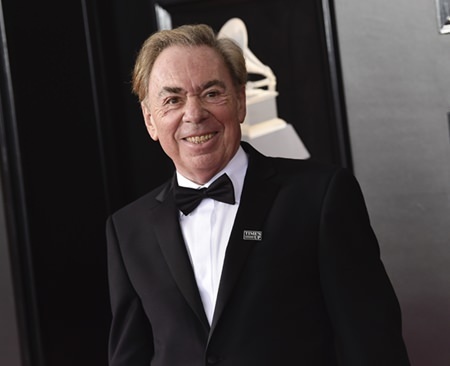 New York (AP) — Andrew Lloyd Webber’s 70th birthday is coming up on March 22 and it turns out there is something the composer really wants on his special day. More work. The man behind such blockbuster shows as “Cats,” ‘’The Phantom of the Opera” and “Evita” has shows in London’s West End, Broadway and on tour, but he’d like to be composing another one. It’s typical of this restless, self-described perfectionist that he’s looking forward as his past is being celebrated in words, performances and music. His autobiography, “Unmasked,” is being released this month, along with a massive, four-CD collection of his songs, performed by the likes of Barbra Streisand, Lana Del Rey and Madonna. The book, which he jokingly refers to as a “medium sized doorstop,” covers the years from his birth to the birth of “The Phantom of the Opera.” It’s honest and very funny. One of the book’s most fascinating sections involves the troubled creation of “Cats,” which became a global phenomenon. Lloyd Webber had to put his own money into the show and watched its progression nervously. Lloyd Webber is positive he’d be unable to get backing for a show like that on Broadway today, though he cheers the imagination of current hits like “Hamilton,” ‘’Dear Evan Hansen,” ‘’Come From Away” and “The Band’s Visit.” None seem safe bets: “Every single one of those four would be considered to be written by somebody who is terminally insane,” he said, laughing. His 480-page autobiography ends in 1986 with “Phantom”: “I resembled a jelly about to enter a pizza oven.” But he doubts he’ll write a second volume. By the end of the first, several key relationships have frayed and betrayal is felt. “On the way down sometimes is when you see peoples’ true colors. I don’t want to write about that. I never want to write about the bad side of people or things,” he said.